Mohamed Fahmy, one of two Al Jazeera journalists still held in Egypt, has renounced his Egyptian citizenship to secure his release, his family say. Mr Fahmy's brother said the journalist, who is also Canadian, was told to give up his nationality or his freedom. Canada says his release is imminent. The status of his Egyptian colleague Baher Mohamed remains unclear. Peter Greste, who was freed on Sunday, said he felt "incredible angst" at leaving his colleagues in a Cairo jail. The Australian journalist was freed from prison and deported after 400 days behind bars. Media captionPeter Greste: "The prison warden said it's time to pack your stuff"
The three Al Jazeera English journalists were arrested in 2013 after being accused of collaborating with the banned Muslim Brotherhood after former President Mohammed Morsi was ousted by the military. All three denied the charges against them and said their trial was a sham. A decree issued by President Abdel Fatah al-Sisi last November allows the deportation of foreign prisoners. Mr Fahmy's brother, Adel, told reporters that the Egyptian authorities gave the journalist the choice between "dropping the nationality or his freedom". "It was a very difficult decision. Mohamed is very proud and comes from a patriotic family of high-ranking military and policemen that have defended this country and fought its wars," Adel Fahmy said. Many of his family members were offended by Mr Fahmy's decision to relinquish his citizenship, he added, but said his fiancee and his mother had pushed him to do so. Canadian Foreign Minister John Baird said on Monday that Mr Fahmy's release was "imminent" but gave no details of a resolution. 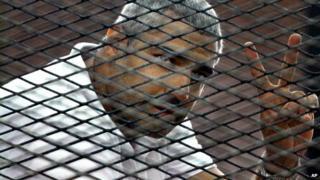 There are still concerns over the fate of Mr Mohamed, however, because he is an Egyptian who holds no dual nationality. Speaking on Monday, Mr Greste said: "If it's right for me to be free then it's right for all of them to be free." He described his release as "a massive step forward" for the Egyptian authorities but added that he felt a "real mix of emotions" after learning he would be freed. There was "real stress in having to say goodbye to my colleagues and friends - people who've really become family inside that prison," he said. In June last year, Mr Fahmy and Mr Greste were sentenced to seven years in prison and Mr Mohamed to 10. Their sentences sparked an international outcry. The three men's convictions were overturned on 1 January but they remained in custody pending a retrial. Several students have also been held in the same case. The students deny working for Al Jazeera but it is thought that material filmed on their phones was used by the network. In a separate case, Abdullah El-Shamy, a journalist for Al Jazeera's Arabic channel, was arrested in August 2013 when police broke up a protest by supporters of Mr Morsi. He was released on health grounds in June 2014 after a hunger strike of nearly five months. According to campaign group Reporters Without Borders, there are currently 165 journalists imprisoned around the world, including 15 in Egypt.